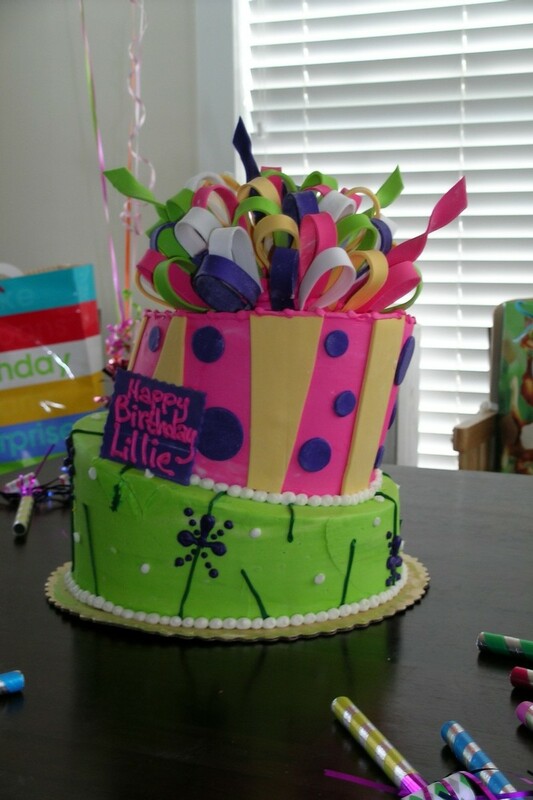 Big kudos to Cake Designs and Bubba's for an outstanding birthday party this weekend. Thanks to everyone for the excellent recommendations! Bubbas sent enough food to feed an army - we are still eating bbq! The cake was beautiful and delicious. Everyone raved about the food, and most importantly, my daughter had a blast. I hope the picture works. Im glad the celebration went great kudos! Very cool cake, they (and you!) did an excellent job. Yes, all edible. Though the fondant bow is REALLY sugary ... but my daughter loved it (of course) and fed pieces of the bow to anyone who got near her. Yay, the cake is awesome!!!! I am so glad Cake Designs did not disappoint!!!! That is SOME cake!! Lots of fondant & gum paste & vibrant colors!! I'm glad you went for it & that Lillie loved it. That's all that matters!! should I move to Charlotte. I hate to be the one to tell you this but you paid good money for a lopsided cake. that's what my husband said too!! Thank you so much for sharing such a great photo and experience!